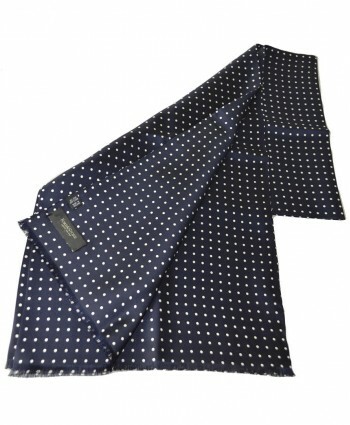 This fine all-silk printed silk scarf features a classic pattern of white polka dot spots on a navy blue background and is hand-finshed with a warp fringe. These 100% silk scarves are hand-made in England using the finest quality Italian printed silk. Approx size: 62" x 13" (160cm x 33cm) Dry Clean Only .. 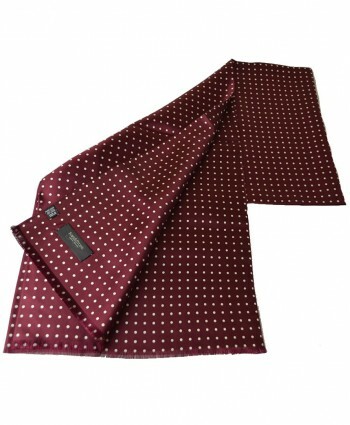 This fine all-silk printed silk scarf features a classic pattern of white polka dot spots on a wine red background and is hand-finshed with a warp fringe. These 100% silk scarves are hand-made in England using the finest quality Italian printed silk. Approx size: 62" x 13" (160cm x 33cm) Dry Clean Only.. 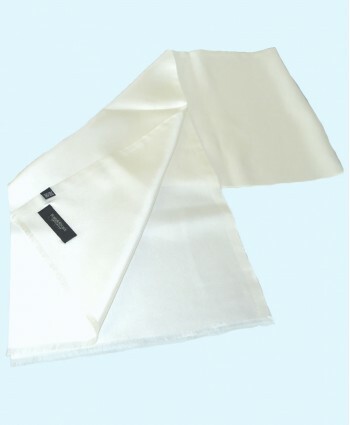 This fine all-silk opera scarf in plain white saglia silk is double-layered and hand-finshed with a warp fringe. These 100% silk scarves are hand-made in England using the finest quality Italian printed silk. Approx size: 62" x 13" (160cm x 33cm) Dry Clean Only.. This fine all-silk printed silk scarf features a classic pattern of white polka dot spots printed on a black background and is hand-finshed with a warp fringe. These 100% silk scarves are hand-made in England using the finest quality Italian printed silk. Approx size: 62" x 13" (160cm x 33cm) Dry Clean Only.. 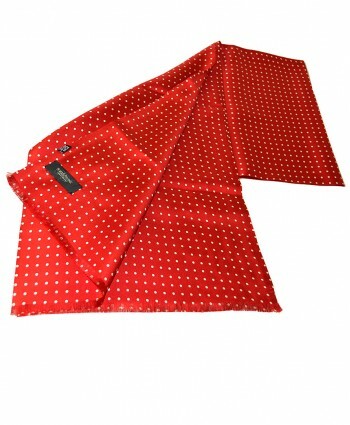 This fine all-silk printed silk scarf features a classic pattern of white polka dot spots printed on a scarlet red background and is hand-finshed with a warp fringe. These 100% silk scarves are hand-made in England using the finest quality Italian printed silk. Approx size: 62" x 13" (160cm x 33cm) Dry Clean Only.. This fine all-silk printed silk scarf features a classic pattern of rose pink polka dot spots printed on a French blue background and is hand-finshed with a warp fringe. These 100% silk scarves are hand-made in England using the finest quality Italian printed silk. Approx size: 62" x 13" (160cm x 33cm) Dry Clean Only.. 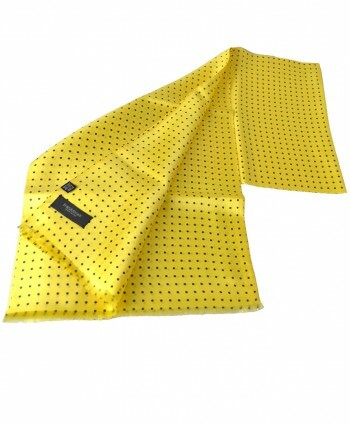 This fine all-silk printed silk scarf features a classic pattern of navy blue polka dot spots printed on a daffodil yellow background and is hand-finshed with a warp fringe. These 100% silk scarves are hand-made in England using the finest quality Italian printed silk. Approx size: 62" x 13" (160cm x 33cm) Dry Clean Only.. This fine all-silk printed silk scarf features a classic pattern of scarlet red polka dot spots printed on a navy blue background and is hand-finshed with a warp fringe. These 100% silk scarves are hand-made in England using the finest quality Italian printed silk. Approx size: 62" x 13" (160cm x 33cm) Dry Clean Only.. 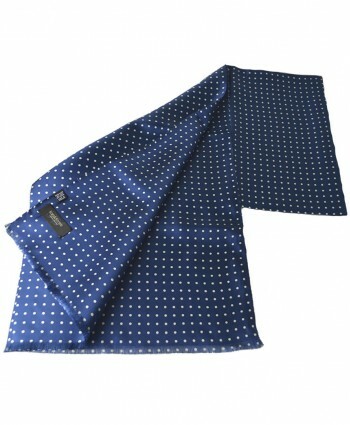 This fine all-silk printed silk scarf features a classic pattern of white polka dot spots printed on a royal blue background and is hand-finshed with a warp fringe. These 100% silk scarves are hand-made in England using the finest quality Italian printed silk. Approx size: 62" x 13" (160cm x 33cm) Dry Clean Only.. 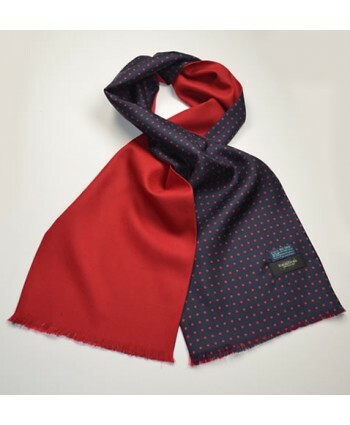 This fine all-silk printed silk scarf features a classic pattern of French blue polka dot spots printed on a bright red background and is hand-finshed with a warp fringe. These 100% silk scarves are hand-made in England using the finest quality Italian printed silk. Approx size: 62" x 13" (160cm x 33cm) Dry Clean Only.. 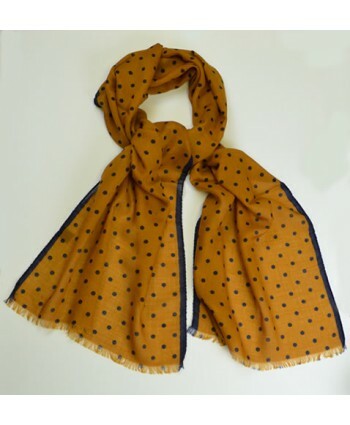 This fine silk and printed silk fringed scarf has a classic pattern of navy polka dots on a yellow background on one side of the scarf and fine British hop sack wool in navy on the other side. This scarf is hand-made in England of finest quality British wool and Italian printed silk. Approx Size: 60” x 10” (152cm x 25cm) Dry Clean Only .. 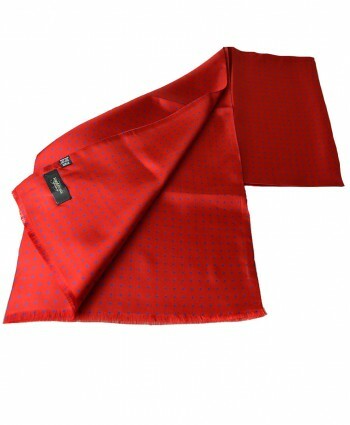 This fine silk and printed silk fringed scarf has a classic pattern of red polka dots on a navy blue background on one side of the scarf and fine British hop sack wool in red on the other side. 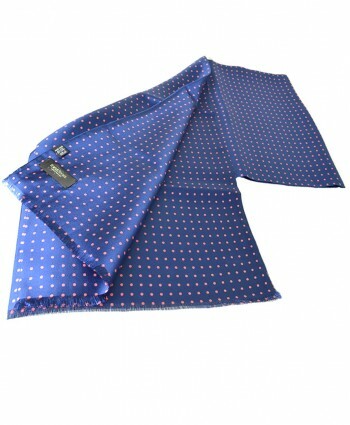 This scarf is hand-made in England of finest quality British wool and Italian printed silk. Approx Size: 60” x 10” (152cm x 25cm) Dry Clean Only .. 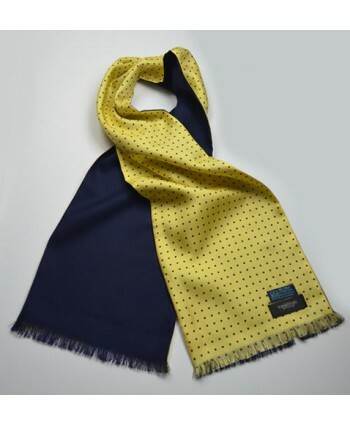 This finely woven silk and wool fringed scarf features a classic pattern of navy blue spots with a narrow border of plain navy blue on a mustard yellow background. These scarves are made in Italy of finely woven silk composed of 70% wool and 30 % silk Approx size: 67" x 17" (170cm x 43cm) Dry Clean Only .. 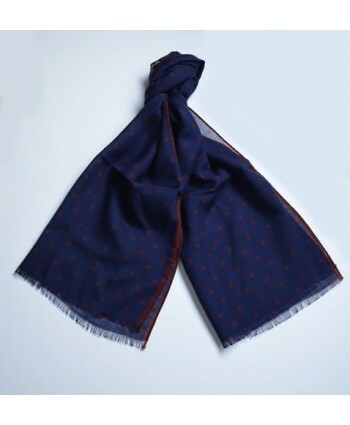 This finely woven silk and wool fringed scarf features a classic pattern of navy blue spots with a narrow border of plain navy blue on a burgundy background. These scarves are made in Italy of finely woven silk composed of 70% wool and 30 % silk Approx size: 67" x 17" (170cm x 43cm) Dry Clean Only .. 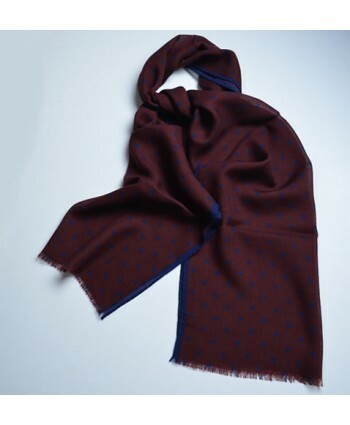 This finely woven silk and wool fringed scarf features a classic pattern of burgundy spots with a narrow border of plain burgundy red on a navy blue background. These scarves are made in Italy of finely woven silk composed of 70% wool and 30 % silk Approx size: 67" x 17" (170cm x 43cm) Dry Clean Only ..